All right, Oddballs, this one is a little strange, but Mobile, AL is way cooler than the weather forecasts would lead you to believe. This melting pot of people, flavors, cultures and traditions has much to offer, both traditional and supernatural. 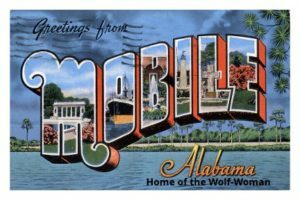 Have you ever heard of the wolf-woman of Mobile? Witnesses described the creature as “pretty and hairy,” and “the top half was a woman and the bottom was a wolf.” Lock your doors and bar your windows, this creature is terrifying and more woman than you can handle. While you’re running from the wolf-woman, stop by the USS Alabama Battleship Memorial and take the self guided tour of the USS Alabama, the Korean War Memorial or the Vietnam War memorial. They have a submarine…jest sayin’. With all that running from were-creatures and walking tours of battleships, you might work up an appetite. Might we recommend Wintzell’s Oyster House? This historic landmark on Dauphin Street in has been cooking up grub for over 75 years. We had to wrestle bears to get the Alabama Top 5!